Thailand is dominant in Southeast Asian birding. The abundance of tropical birds is unmatched by her neighboring countries. It's convenient and the birds are plentiful. Khao Sok National Park is certainly one of the best bird watching destination in southern Thailand. It is the hornbill capital of Southern Thailand. Marsh areas such as Thale Noi provide great birding for those interested in seeing water birds. Migratory shorebirds are easy to see from a kayak. 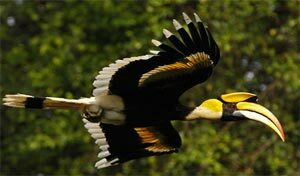 The lush jungles, rainforests and marshes of southern Thailand offer birders with many marvelous opportunities. Thailand situated in South-east Asia, the Indo Chinese peninsula of the Oriental Region and has been described as a "zoogeographic crossroads'" because the country's avifauna comprises Sino-Himalayan, Indo-Burmese, Indo-Chinese and Sundaic elements and large number of migrant visitors from the Palaearctic Region. There are approximately 996 species at present or 10% of the world species are recorded in Thailand. Thailand has a tropical monsonnal climate. Generally dry season is during November to April and the rainy season from May to October but, the far south and South-eastern provinces receive rain during November - January. We specialize in arranging birdwatching trips for visitors to Thailand. 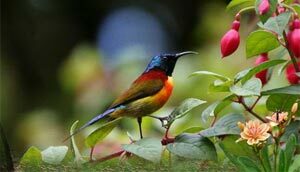 If you are planning to visit Thailand, for business or pleasure, and would like an escorted trip to top birding sites around Thailand,then please browse through our website to see what we can offer. We have the area’s foremost Bird Watching guides with extensive experience and local knowledge, speaking English,German and Thai. Geologically the country can be divided in the following way. The Central Plain extends to the coast around Bangkok and consists of areas of marshy floodplains. The North lying between the Mekong and Salween Rivers, is mainly mountainous, the highest peak at Doi Inthanon is 2,565m above sea level. The Northeast consists of dry plateau (Korat Plateau) mostly consisting of dry soil but there are some good forests such as Khao Yai located in this region. The East and Southeast has the isolated mountains of Khao Soi Dao at the westward part of the country near the Cambodia border. The West and Southwest has a large forested area and is divided from the Burmese border by the Tanassarim range. The South lying between the Andaman sea and the Gulf of Thailand. Peninsula Thailand is the southern part, which is a part of Sunda faunal sub-region.